AGROCOIN aims to make the fastest, most transparent and safe transactions. Talking about AgroExchange, it is a web-based platform that acts as a guarantor of the transaction between end users with the help of Blockchain technology. it Is comprised of multiple decentralized Payment options, state of art trading facility, intuitive user interface and high-security protocol that make sure the seamless trades and transactions across the platform. Users can list their Agri and food products on the exchange and get the real-time price notifications & sell them with the highest return possible. Consumers will also be able to buy the same product by paying a smaller fee. Our AgroDex platform is blockchain-based and focuses on trade in agricultural crops and food products. Our AgroExchange platform also aims to contribute to global adoption of blockchain technology by ordinary people through integration with e-commerce channels using a decentralized payment platform. Buyers and sellers who have registered on the platform can make smart contracts, transact with each other, share food-related information and track the history of food prices from various sources around the world. The AgroDex platform is also powered by the AgroCoin cryptocurrency which guarantees payments between users on the platform. Cryptocurrency is now trying to become an important tool in the agro-industry market by providing a safe, transparent and decentralized way to buy agricultural products to buyers and sellers. After registering with our AgroDex mobile application platform, users will be entitled to have access to a large collection of producers and suppliers of agricultural products near users. All products on our platform are classified and assessed using AgroCoin. And to be able to have access to products from producers or sellers, users must purchase AGROCOIN cryptocurrency at AgroDex. After the user identifies the seller with a product that matches the desired quality and price specifications, the user can also buy the product by starting a smart contract with the seller. The platform will then begin the transaction process and immediately contact their logistics partners to notify them of the transaction and arrange product delivery. Our AgroExchange platform aims to be able to contribute to global users of Blockchain Adoption among ordinary people with intuitive and seamless integration of the many E-Commerce channels that are used using the Decentralized Payment platform. The AgroExchange Web platform is the result of detailed studies of user behavior. Registration is very simple and easy, KYC is super fast, security is very high and there are several options for cash-in and cash-out. AgroExchange also acts as guarantor of transactions between end users with the help of Blockchain technology. AgroExchange can also allow producers to sell their goods as well as possible, in the right position, and at the right time. A fully designed solution by the AgroExchange team from the start to meet specific business and customer demands. All transactions using AgroCoin are guaranteed by Smart Ethereum contracts. Both buyers and sellers have electronic digital signatures (EDS) that will sign smart contracts for them. This ensures that the transaction has maximum protection and that trading is safe using AgroCoin. AgroDex can also be accessed through our mobile application which allows users to find suppliers or customers of agricultural products, identify prices of agricultural products currently on the market, or even identify gaps in the agricultural industry. 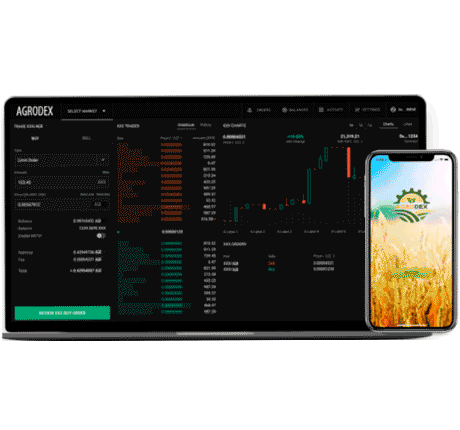 AgroDex also has technology in the blockchain that will be able to integrate its trading system which will make trade more transparent while ensuring fair market prices. Using blockchain technology can also ensure that transaction and operational costs remain low for buyers and sellers around the world. September 2018 – Origin of the idea by the Founders | Conversion of Idea into a Business Plan. November 2018 – Developing Core Team | Company Establishment | Developing the Agro Token. December 2018 – Technical Architecture | Phase 1 Android and IOS App Development | Starting Pre Sale. January 2019 – Started Level 1 Marketing | Phase 2 App Completion | Completed Team Building. February 2019 – Started Bounty | Listing on ICO sites | Expanding Advisory board | ICO Preparation. For more information, you can visit the official Bitagro website below.